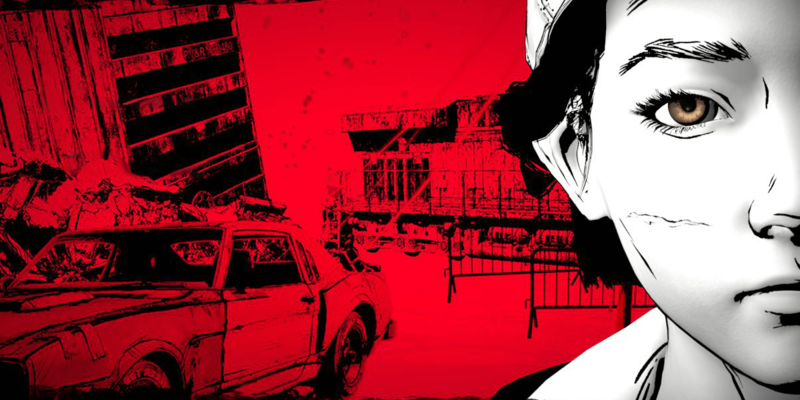 This game strays from the path of previous FromSoftware titles, which relied less on characters and narrative in favor of deeper world-building. 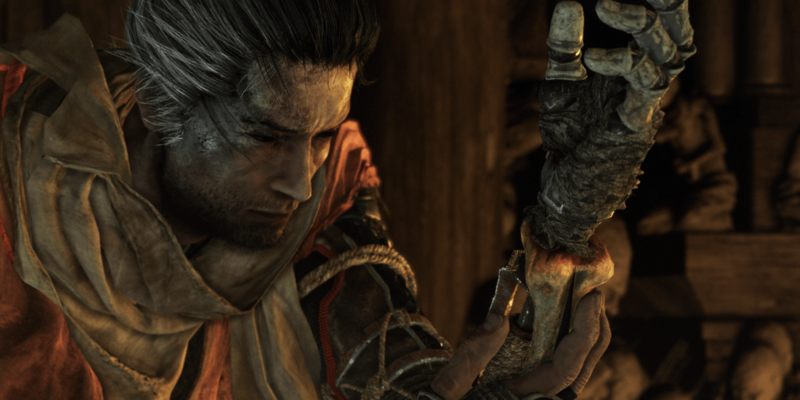 The story of Sekiro: Shadows Die Twice starts with a flashback to establish the fundamentals. After our protagonist is taken off a bloody battlefield and adopted by the shinobi, Owl, years pass and he is eventually charged with protecting his master. When time jumps forward again, we find the character, now named Wolf, with no will to live and being held prisoner. This is where the journey begins. 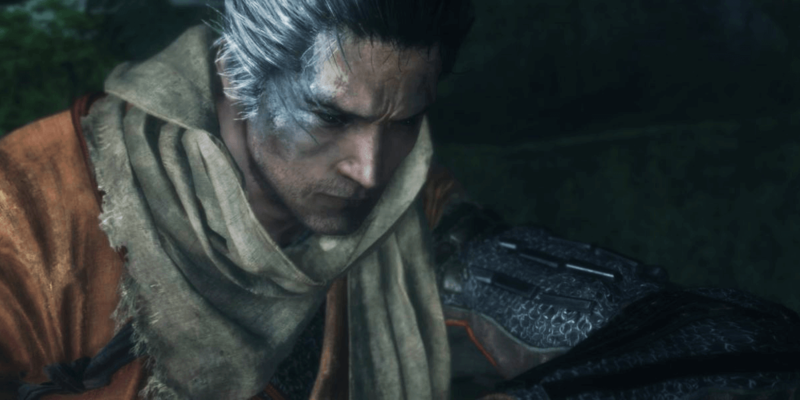 Finding the Divine Heir to help him escape is a rather simple mission that is quickly made difficult by the antagonist, Genichiro of the Ashina Clan. Our character loses an arm in the ensuing fight and fails his mission in the process. The villain leaves him for dead with the Divine Heir in his possession. One must hit a low point in his hero’s journey before the path to victory reveals itself. 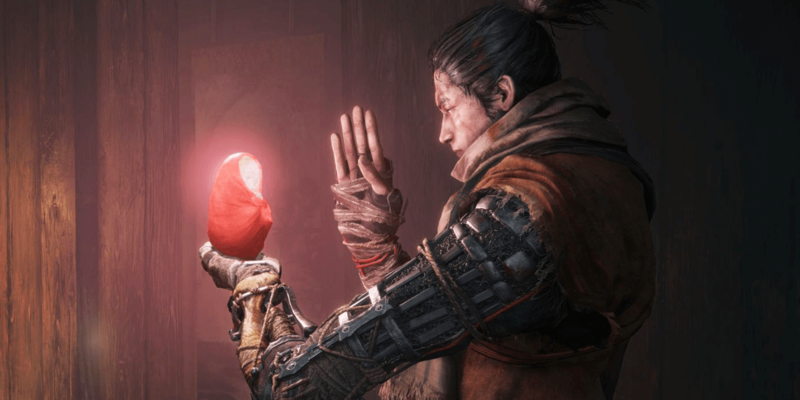 Sekiro wakes up to find an artificial appendage, dubbed the Shinobi Prosthetic, where his left arm once was and the renewed task of finding the Divine Heir begins once more. The story then leads us through a narrative that plays out as we get closer to the finding the heir and diving into memories of the protagonist to help shed some light on the failures that haunt him. Encounters with non-playable characters are scattered throughout the lands visited during this quest and help build the world surrounding Wolf. Conversations with the people along the way give larger detail to the happenings of the world, while at the same time cryptically hinting at the years the main character can’t seem to remember. These interactions gain weight by the performances of the voice actors. From the start, Sekiro insists on using the Japanese language. Though you are able to go through the options and select English voices, using the native language of the character’s homeland lends to the aesthetic of the game’s world, building up the story’s immersion very effectively. Each character’s dialogue is intense and to the point, leading you to gain a familiarity for their personalities, which in turn leads to big surprises when the unexpected happens. The character-building serves to intensify the boss battles and gives them deeper impact than those found in previous FromSoftware games. NPCs can be eavesdropped on to learn a little information on the next boss coming up as well. Between this and the dialogue shared by the bosses, who may be famous warriors or foes from Wolf’s past, these encounters gain a deep sense of importance to the progress of this journey. And like the games before this, these boss battles are brutal. Unlike in other “Soulsbourne” games, there aren’t fog gates letting you know a boss battle lays in your path. 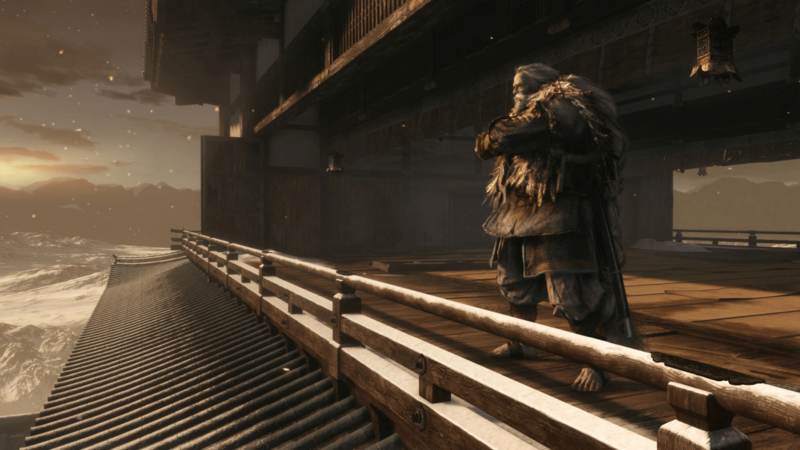 In Sekiro, you can jump into a new area and find yourself being run down by a boss, scrambling to figure out how you can survive this encounter. With a slightly more realistic take on the world, the bosses I have faced so far have a classic action-movie feel compared to the horror experiences of the prior games. These battles will force you to utilize every skill you’ve managed to attain during your journey so far. Having to know if a boss’ attacks are going to be deflectable or only avoidable through precise dodging may only be proven after multiple deaths, as these bosses pack a plethora of moves and strategies to kill you. Much like the mini-bosses faced throughout this journey, the main bosses have multiple vitality bars and whittling one down to finally deliver a deathblow is only a small victory. The boss immediately fills up its bar again, which feels similar to the resurrection ability you’ve used to slay your own foes. With this new lease on life, the bosses often implement new attacks and patterns to further make you feel hopeless in the battle. Knowing when to attack, dodge, parry, or even to heal is learned through a perseverance to end these encounters, or through multiple deaths and repetition. So far, these boss battles have felt fair with death being the result of my own failure to keep patience or mixing up the enemy’s pattern, attacking when I should have been defending. The one thing that Sekiro: Shadows Die Twice has in common with FromSoftware’s past games is the feeling of victory. Defeating an enemy holds a feeling of satisfaction not seen in many other games. It feels earned and, after multiple deaths, justified. 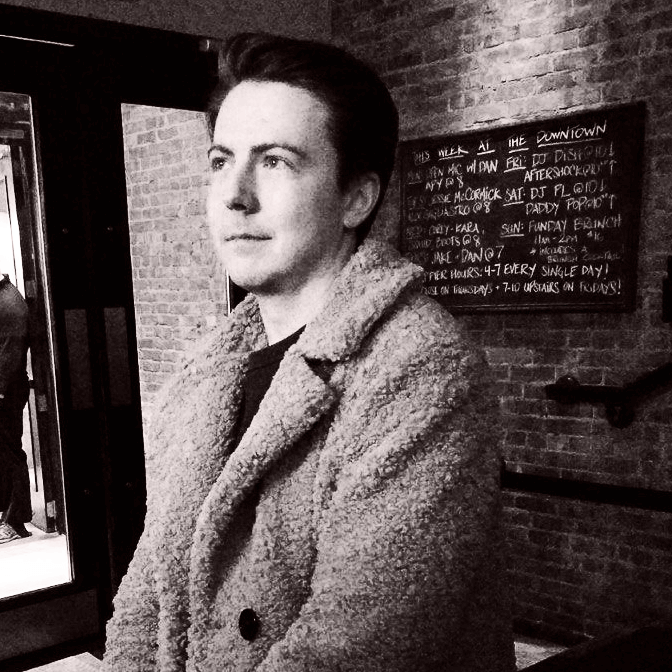 Overcoming these immense challenges only drives me to keep going and see what lies ahead. Obligatory Disclosure: Activision provided Dead Entertainment with a copy of the game for review and article consideration following its launch. 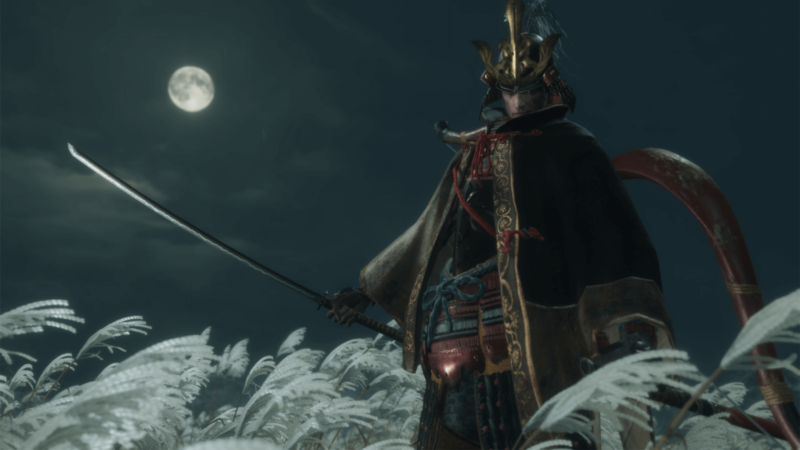 Challenge, freedom, and death highlight our first weekend with FromSoftware’s newest title. Since being introduced to video games at a young age, Ryan has enjoyed countless titles and sharing those experiences with friends and family. With a love for story-building, video games helped shape his imagination and interest in authors. When not playing games or reading, he’s coming up with excuses on how to get out of the plans he made or forgetting what he walked in the room to get.